In this service the following basic quantities relevant to human health have been produced: Vitamin D weighted daily doses, Erythemally weighted daily doses, and daily maximum UV index. Information about UV radiation and its health effects can be found here. Phase 3 is the final stage of the Promote Project. In Phase 3 the UV Record has been processed for the pediod of July 1983 to June 2007. The UV products are based on ISCCP D1 cloud data and KNMI-assimilated ozone . The focus has been to produce the long-term global UV data using the algorithm developed in Phase 2. The results have been validated against ground-based UV data. The starting point for Phase 2 of PROMOTE was a set of individual UV monitoring services developed in Phase 1 of PROMOTE. These are the TEMIS UV radiation archive that provides UV records based on GOME, SCIAMACHY and MSG data; and UV Record service that provides UV records based on Nimbus-7 and Earth Probe TOMS instruments. The Phase 1 services provide daily maps and local time series of UV index and daily dose data. In Phase 2 the UV Record service will be upgraded to become an integrated service that provides global and homogeneous surface UV time-series. In 2007 the primary goal was to ensure continuation of the UV time-series with surface UV data based on the OMI instrument. Future objective is to integrate the existing satellite-based surface UV time series into a longterm multi-sensoral UV record. The integrated service will be based on the PROMOTE total ozone record service and the International Cloud Climatology Project (ISCCP) cloud data. A prototype of the new integrated service will be available in 2008. The service will be completed in year 2009. Validation of the UV Record service will be based on utilization of ground-based spectral measurement data from the European UV Database (EUVDB) and UV time series obtained using reconstruction methods. Link to the detailed description of methodology: PDF file. (1) A reference action spectrum for ultraviolet induced erythema in human skin, ed. A. F. MacKinley and B. L. Diffey, CIE J., 1987, 6((1)), 17-22. 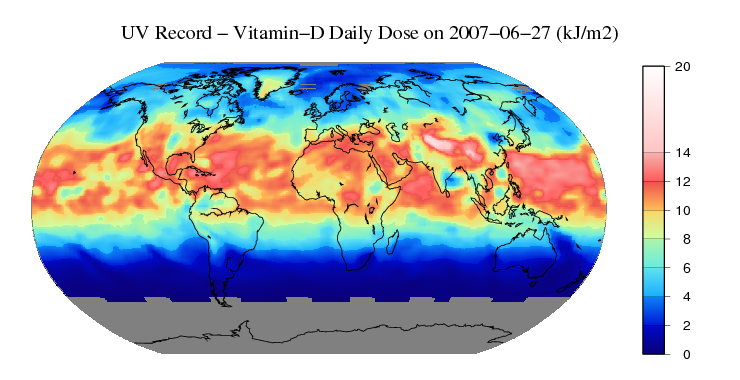 (2) CIE (International Commission on Illumination), Action spectrum for the production of previtamin D3 in human skin, CIE, 174, 2006. 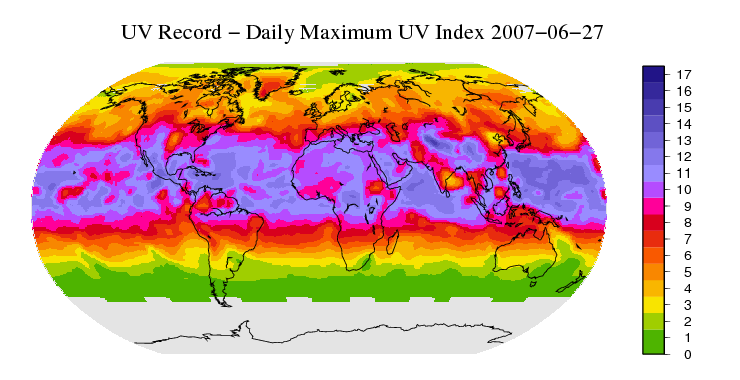 (4) The PROMOTE UV Record: toward a global satellite-based climatology of surface ultraviolet irradiance, A. Lindfors, A. Tanskanen, A. Arola, R. van der A, A. Bais, U. Feister, M. Janouch, W. Josefsson, T. Koskela, K. Lakkala, P. N. den Outer, A. R. D. Smedley, H. Slaper, and A. R. Webb, accepted for publication in IEEE Journal of Selected Topics in Applied Earth Observations and Remote Sensing (IEEE J-STARS). (5) Tanskanen et al. (2007), Validation of daily erythemal doses from Ozone Monitoring Instrument with ground-based UV measurement data, JGR, 112, D24S44, doi:10.1029/2007JD008830.